On June 22, 2017, the Neighborhood Hub located on Lowry and Washburn in North Minneapolis held their fifth annual Healthy Homes Resource Fair. 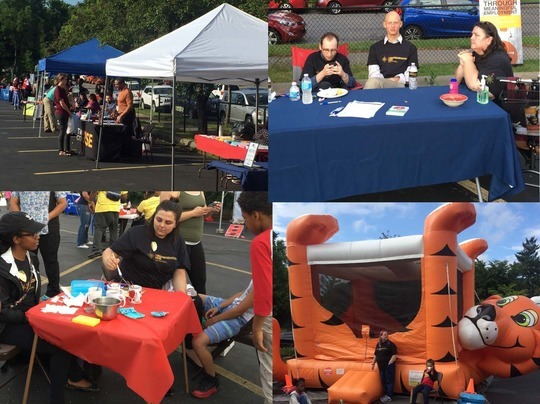 Organizations from the Northside set up tables and booths in order to connect with and offer free resources to the community they serve. The Neighborhood Hub was thoughtful in the planning of this event and supplied many activities that were aimed at children. These activities included a bouncy house, face painting, dancing and even free lead testing for children. Partnering organizations supplied dinner that included chicken, corn on the cob, baked beans, fruit and dessert, keeping in mind all dietary restrictions. The University of Minnesota's Supplemental Nutritional Assistance Program Education (SNAP-Ed) project gave out matter boxes and signed up community members for an email list to provide them with more information around the SNAP program and healthy eating. The Minneapolis Promise zone VISTAs were able to volunteer their time and build relationships with the community including set up, face painting, temporary tattoos and clean up. Although the weather in the morning was not cooperating, when the Health Homes Resource Fair began, the sun came shining on through, making the evening the perfect place for families to come and enjoy time with their community. Until now, Posts on Google only allowed a small number of celebrities, sports teams, movie studios and museums to post social network-style updates about their activities right to Google's search result pages. Using this, these organizations could post images, videos, GIFs and text and use that to drive traffic to their sites. Starting now, local businesses can also use this feature to publish their events, product and services (or just a photo of a nice cupcake) to Google Search and Maps. Google says local businesses can use this new feature to, for example, share daily specials and current promotions to promote events and showcase new products. What's maybe even more important for these businesses, though, is that they can link these posts to their own sites and use Posts on Google to drive sign-ups for their newsletters or get potential customers to specific product pages. There might be unclaimed money waiting for you from unpaid wages. The Wage and Hour Division (WHD) works on behalf of employees to recover back wages that have resulted from labor law violations. 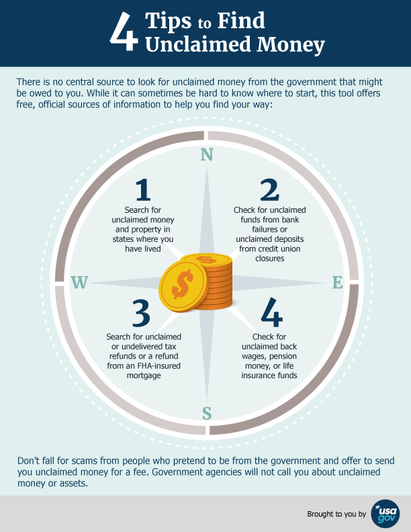 Get more information and services to help you find unclaimed money from the government at USA.gov. Welcome to Community Development Block Grant's (CDBG) video tutorial on How to Use CDBG for Public Service Activities. You will learn about CDBG's eligible and ineligible public service activities, receive guidance on how to determine the appropriate national objective category for public services, and how to document compliance with the national objective. We will explain why public services can strengthen grantee communities and review considerations for building an effective public service program in order to maximize impact in the community. Amazon is attempting to lure low-income shoppers from Walmart by offering a discount on its pay-by-month Prime membership for people who receive government assistance. The giant online retailer said in a statement Tuesday that people who have a valid electronic benefits transfer card - used for programs such as the Supplemental Nutrition Assistance Programs, or food stamps - will pay $5.99 per month for a year. Some intersections are riskier to cross than others, but looking at the number of pedestrian injuries alone doesn't tell the whole story. A new study from Minneapolis combines crash data with pedestrian counts to deliver a more nuanced picture of traffic dangers for people on foot. Among the findings: There's safety in numbers for pedestrians. Turner and business partner, Chaz Sandifer, created that fitness sisterhood in the Twin Cities to help close the disproportionate health risks that African-American women face. Almost 80 percent of African-American women in the U.S. are obese or overweight and they have high rates of type 2 diabetes and heart disease. When we go looking for a dentist, what we will most likely find are White males. According to the 2014-15 "Minnesota Dentists Workforce Survey," 67 percent of dentists are male, 92 percent are White, and 0.7 percent are African American. A young African American Woman from North Minneapolis has successfully challenged those odds. Spirit within and for the school has been boosted by state championships in basketball and football. And the mighty effort that the community and alums waged to keep the school alive helped attract students. The positive changes demonstrate that with the right leadership, staff, instruction and community support, struggling schools can be transformed. Red, White & Blue Pamper Me Party! For past email updates from the Minneapolis Promise Zone, please visit www.ci.minneapolis.mn.us/promisezone/. THE ALLSTATE FOUNDATION is inviting U.S. nonprofit organizations that address domestic violence to join the annual Purple Purse Challenge. This competition gives nonprofits that offer financial empowerment services to domestic violence survivors a chance to compete for a total of $700,000 in incentive funding. This year, the Foundation will partner with up to 250 national, state and local nonprofit organizations. These organizations will be divided into two divisions of roughly equal size based on organizational budget. Each selected Community Partner will have its own “Team Page” where it can raise funds through the Challenge from October 2 through October 31, 2017. At the end of the Challenge, the Foundation will award grand prize grants ranging from $5,000 to $100,000 to the top seven organizations in each division. The deadline to apply to be a Community Partner is 8/1/2017. (Organizations are encouraged to apply early to take advantage of training and support leading up to the competition in October.) Visit the Foundation’s website here to learn more about the Challenge. THE WALMART FOUNDATION STATE GIVING PROGRAM awards grants to nonprofit organizations throughout the U.S. and Puerto Rico for programs that give individuals access to a better life. There are three funding cycles per year; the first two funding cycles are targeted to specific states. For the final funding cycle of the year, requests are accepted from organizations nationwide in the following two categories: Hunger Relief supporting programs such as food pantries, backpack programs, and SNAP outreach; and Community Engagement supporting other programs that focus on the unmet needs of underserved low-income populations. Examples of eligible programs include career opportunity, disaster preparedness, education programs, healthcare access, shelters, etc. Grants range from $25,000 to $250,000; the average grant size is $40,000. Deadline: applications for the final funding cycle will be accepted from 8/7/2017 through 8/11/2017. Visit the Foundation’s website here to learn more about the State Giving Program. THE LOWE'S CHARITABLE AND EDUCATIONAL FOUNDATION is offering grants through the Foundation’s Community Partners grant program to nonprofit organizations and local municipalities undertaking high-need projects such as building renovations and upgrades, grounds improvements, technology upgrades and safety improvements. Grants range from $2,001 to $100,000. Applications for the fall funding cycle will be accepted from 7/3/2017 to 8/25/2017. Visit the company’s website here to review the giving guidelines and to take the eligibility quiz. Grants of up to $75,000 will be awarded to youth education projects with a specific focus on STEM (science, technology, engineering, and mathematics) subjects and the environment. Note: The CDC designation does not need to be specified on any official documents as long as the three requirements stated below are met. To be eligible for the CED program, an applicant must meet three conditions: 1. Applicant must be a private, nonprofit CDC with 501(c)(3) status; 2. Applicant must have articles of incorporation or bylaws demonstrating that the CDC has as a principal purpose the planning, developing, or managing of low-income housing or community economic development activities; and 3. The Board of Directors must have representation from each of the following: community residents, business leaders, and civic leaders. Faith-based and community organizations that meet the eligibility requirements are eligible to receive awards under this funding opportunity announcement. Applications from individuals (including sole proprietorships) and foreign entities are not eligible and will be disqualified from competitive review and from funding under this announcement. The Administration for Children and Families (ACF), Office of Community Services (OCS) will award approximately $17.2 million in Community Economic Development (CED) discretionary grant funds to Community Development Corporations (CDC) for well-planned, financially viable, and innovative projects to enhance job creation and business development for individuals with low income. CED grants will be made as part of a broader strategy to address objectives such as decreasing dependency on federal programs, chronic unemployment, and community deterioration in urban and rural areas. CED projects are expected to actively recruit individuals with low income to fill the positions created by CED-funded development activities, to assist those individuals to successfully hold those jobs and to ensure that the businesses and jobs created remain viable for at least one year after the end of the grant period. CED-funded projects can be non-construction or construction projects, however, short-term construction jobs associated with preparing for business startup or expansion are not counted when determining the number of jobs created under the CED program as they are designed to be temporary in nature. OCS is encouraging applications from CDCs to target rural areas and underserved areas in states without current projects. Furthermore, OCS is encouraging projects that align with the Promise Zones Initiative or Choice Neighborhoods Program. Through Our Town, subject to the availability of funding, the National Endowment for the Arts will provide a limited number of grants for creative placemaking. Our Town requires partnerships between arts organizations and government, other nonprofit organizations, and private entities to achieve livability goals for communities. Projects that Build Knowledge About Creative Placemaking. These projects are available to arts and design service organizations, and industry, policy, or university organizations that provide technical assistance to those doing place-based work. Matching grants range from $25,000 to $100,000. Where appropriate, Our Town applications should demonstrate how the project will align with other place-based federal grant programs and policies, including, but not limited to, those from the Department of Housing and Urban Development, Department of Transportation, Department of Commerce, Environmental Protection Agency, Department of Justice, Department of Agriculture, Delta Regional Authority, and Appalachian Regional Commission. Related federal programs may include Promise Zones, Consolidated Plans, Long Range Transportation Plans, and Asset Management Plans, as well as strategies to modify existing policies. Grants support the survey, inventory, and designation of historic properties that are associated with communities currently underrepresented in the National Register of Historic Places and among National Historic Landmarks. Within one year of the completion of the grant, all projects must result in: the submission of a new nomination to the National Register of Historic Places or National Historic Landmark program OR an amendment to an existing National Register or National Historic Landmark nomination to include underrepresented communities. The purpose of this Funding Opportunity Announcement (FOA) is to support substantive investigation of the role of individual residential histories in cancer etiology and outcomes, and to encourage the development of complex analytical strategies in support of substantive investigation. CDC seeks to enhance the Nation's ability to rapidly mobilize and respond to specific public health emergencies, which may include infectious disease outbreaks, pandemics, and other public health emergencies that exceed the capacity of jurisdictional public health resources. From experience through previous emergency events, CDC recognizes the impact that initial funding and immediate response can have in mitigating negative health outcomes. Thus, CDC is creating this Notice of Funding Opportunity (NOFO) to rapidly fund pre-approved applicants to address immediate and time-sensitive needs that are integral to specific public health responses. This NOFO is intended to fund jurisdictional public health departments for response to HHS Secretarial declared and non-declared public health emergencies and other public health emergencies which CDC deems in accordance with the purpose of the NOFO. The award dates and project periods listed are subject to change and are contingent upon the occurrence of a public health crisis as defined in this NOFO and the availability of funding for the response. Awardees would be approved but unfunded until a crisis occurs, enabling them to plan for emergency activation activities. CDC has strong relationships with state and local health departments, community-based organizations and other domestic partners and supports them for planning, capacity-building, preparedness, and response to public health emergencies. This support is provided through various programs including the Public Health Emergency Preparedness (PHEP) and the Epidemiology and Laboratory Capacity for Infectious Diseases (ELC) cooperative agreements. This new NOFO complements these ongoing capacity-building and response programs by providing a mechanism for CDC to rapidly mobilize and fund jurisdictions for specific response needs for specific public health emergencies. The National Human Genome Research Institute (NHGRI) is soliciting grant applications for the support of Centers of Excellence in Ethical, Legal and Social Implications (ELSI) Research (CEERs). The CEER Program is designed to support the establishment of sustainable trans-disciplinary research teams with the expertise and flexibility to anticipate, conduct research on, and quickly address a range of cutting edge ethical, legal, and social issues related to genetics and genomics. The Program is intended to create new research opportunities that cross disciplinary boundaries among investigators in diverse fields, such as the genomic sciences, clinical research, clinical and health policy, ethics, law, the humanities, economics, political science, anthropology and other social sciences. In addition to conducting trans-disciplinary research, Centers will disseminate their research findings as well as facilitate the use of their findings to develop relevant research, health and public policies and practices. Finally, Centers will contribute to developing the next generation of ELSI researchers. With an emphasis on two-year colleges, the Advanced Technological Education (ATE) program focuses on the education of technicians for the high-technology fields that drive our nation's economy. The program involves partnerships between academic institutions and industry to promote improvement in the education of science and engineering technicians at the undergraduate and secondary school levels. The ATE program supports curriculum development; professional development of college faculty and secondary school teachers; career pathways; and other activities. The program invites research proposals that advance the knowledge base related to technician education. It is expected that projects be faculty driven and that courses and programs are credit bearing although materials developed may also be used for incumbent worker education. The ATE program encourages partnerships with other entities that may impact technician education. The purpose of the High School Career and Technical Education (CTE) Teacher Pathway Initiative is to improve CTE programs assisted under the Carl D. Perkins Career and Technical Education Act of 2006 (the Perkins Act) by increasing the supply of high school CTE teachers available to teach students in CTE programs that align to In-Demand Industry Sectors or Occupations \1\ in States and communities where shortages of such teachers exist. Purpose of Program: The Academies Program supports the establishment of: (1) Presidential Academies for the Teaching of American History and Civics that offer workshops for both veteran and new teachers to strengthen their knowledge of American history, civics, and government education (Presidential Academies); and (2) Congressional Academies for Students of American History and Civics that provide high school students opportunities to enrich their understanding of these subjects (Congressional Academies). The Arts Endowment's support of a project may start on or after June 1, 2018. Generally, a period of performance of up to two years is allowed. Program Description The guiding principle of "Art Works" is at the center of everything we do at the NEA. "Art Works" refers to three things: the works of art themselves, the ways art works on audiences, and the fact that art is work for the artists and arts professionals who make up the field. Art works by enhancing the value of individuals and communities, by connecting us to each other and to something greater than ourselves, and by empowering creativity and innovation in our society and economy. The arts exist for beauty itself, but they also are an inexhaustible source of meaning and inspiration. The NEA recognizes these catalytic effects of excellent art, and the key role that arts and design organizations play in revitalizing them. To deepen and extend the arts' value, including their ability to foster new connections and to exemplify creativity and innovation, we welcome projects that: • Are likely to prove transformative with the potential for meaningful change, whether in the development or enhancement of new or existing art forms, new approaches to the creation or presentation of art, or new ways of engaging the public with art; • Are distinctive, offering fresh insights and new value for their fields and/or the public through unconventional solutions; and • Have the potential to be shared and/or emulated, or are likely to lead to other advances in the field. Beyond encouraging projects that demonstrate these characteristics, we want to achieve the following four objectives through the Art Works category: • Creation: The creation of art that meets the highest standards of excellence, • Engagement: Public engagement with diverse and excellent art, • Learning: Lifelong learning in the arts, and • Livability: The strengthening of communities through the arts. The Humanities Open Book Program is designed to make outstanding out-of-print humanities books available to a wide audience. By taking advantage of low-cost “ebook” technology, the program will allow teachers, students, scholars, and the public to read humanities books that have long been out of print. The Humanities Open Book Program is jointly sponsored by NEH and the Andrew W. Mellon Foundation. Traditionally, printed books have been the primary medium for expressing, communicating, and debating humanistic ideas. However, the vast majority of humanities books sell a small number of copies and then quickly go out of print. Most scholarly books printed since 1923 are not in the public domain and are not easily available to the general public. As a result, there is a huge, mostly untapped resource of remarkable scholarship going back decades that is largely unused by today’s scholars, teachers, students, and members of the public, many of whom turn first to the Internet when looking for information. Modern ebook technology can make these books far more accessible than they are today. NEH and Mellon are soliciting proposals from academic presses, scholarly societies, museums, and other institutions that publish books in the humanities to participate in the Humanities Open Book Program. Applicants will provide a list of previously published humanities books along with brief descriptions of the books and their intellectual significance. Depending on the length and topics of the books, the number to be digitized may vary. However, NEH and Mellon anticipate that applicants may propose to digitize a total that ranges from less than fifty to more than one hundred books. Awards will be given to digitize these books and make them available as Creative Commons-licensed “ebooks” that can be read by the public at no charge on computers, mobile devices, and ebook readers. The final ebook files must be in EPUB version 3.0.1 (or later) format, to ensure that the text is fully searchable and reflowable and that fonts are resizable on any e-reading device. BJA seeks applications for a Technical Assistance Provider (TA Provider) to assist in the establishment and facilitation of national-level technical assistance to approximately 20 to 25 demonstration sites in furtherance of the Sentinel Events Initiative (SEI). SEI is an effort led by the National Institute of Justice the US Department of Justice's research, development, and evaluation agency to explore whether an all-stakeholder, forward-looking, non-blaming review of unanticipated events that signal an underlying system weakness in criminal justice can be used to understand areas of system risk and weaknesses, reduce the occurrence of these outcomes, increase safety, and augment the criminal justice system's ability to fulfill its mission. Drawing heavily from similar successful efforts in the fields of medicine and transportation, this scientific inquiry aims to determine a) whether sentinel event reviews (SERs) can be implemented and routinized in a criminal justice context, b) whether these reviews can inform policy and practice improvements to mitigate the risk of analogous errors or weaknesses in the future, c) whether changes in policy and practice maximize the criminal justice system's ability to meet its mission of reducing crime, protecting the public, and advancing the administration of justice, and d) whether these reviews are sustainable over time.